A variety of plating tools are available, but let's start basic. Gather a brush, a piping bag, a saucier spoon, a few squeeze bottles, and a set of precision tongs. Next, pick a plate shape to work with. In this classic example, we'll use a square plate. Use the bag to pipe the mashed potatoes onto the plate, and with the precision tongs, carefully stack the carrots and add the garnish. Set the steak on the bottom portion of the plate, making sure that the starch (the potatoes) are placed within the 9 to 12 o'clock zone, the vegetables (the carrots) are within the 12 to 3 o'clock zone, and the protein (the steak) between 3 and 9 o'clock. Apply the garnish on the steak using the precision tongs, and then use the saucier spoon to add the demi-glace. Finally, wipe the edges to ensure a clean, elegant presentation. Now, let's try plating free form. With the piping bag, again pipe the potatoes, but this time create several dollops of varying sizes across the plate. Slice the fillet and plate the slices at interesting, artistic angles. With the saucier spoon, spread small piles of Lima beans and peas between the other dishes. Prop up a couple carrots along a steak slice, and then try setting a few apart from the already plated food. Next. with a plastic squeeze bottle, add dollops of pea puree onto the plate (and maybe even on the steak). Then, apply dollops of a demi-glace with a second squeeze bottle. Use the precision tongs to plate a garnish, and don't forget to wipe the edges of the plate when finished! Now let's consider landscape plating. Dollop the pea puree on the plate, and then with the brush, swipe across the puree, spreading it across the plate's surface. With the piping bag, pipe the potatoes on the edge of the puree, placing the carrots diagonally beside the starch using the precision tongs. Add several layers of carrots, creating a small tower. Next, use the tongs to lean the filet across the carrots and potatoes. Sprinkle Lima beans and peas on the plate's remaining surface, and then drizzle the demi-glace around the food in arches. Finally, gently place the garnish on top of the food with tongs. Wipe the edges of the plate. You've now learned the basic plating techniques, so have fun taking the presentation of your meals to the next level! Amp up the presentation of your meals by mastering three basic food plating techniques! Though artistic and impressive, plating does not need to be difficult. In less than 2 minutes, you can learn the need-to-know basics, and start adding flair to your food! This video shows you how. 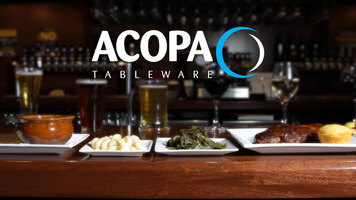 Boasting a great value and unbeatable price, Acopa dinnerware is the ideal choice for busy bars, restaurants, or catered events. Available in a variety of sizes and shapes to accommodate virtually any table setting, you'll have no trouble finding the perfect set for your establishment. 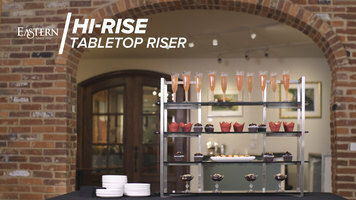 Take your buffet displays to the next level with the help of a Hi-Rise tabletop riser from Eastern Tabletop! With a simple but sophisticated design, this riser lets you serve and display your appetizers or drinks on multiple shelves for a dynamic, eye-catching look at your buffet or catered event. With a durable wood construction and stylish accents, these Hercules wood folding chairs are a great option for weddings, banquets and more. 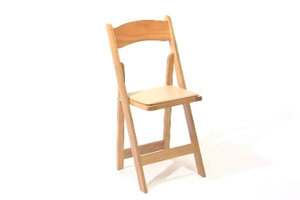 Watch this video to see all the benefits of the Hercules series wood folding chairs!